If all Syrians coming to America were like the UK’s Halla Diyab, the Leftwingers would be leading the charge to STOP Syrians from coming here. One country she lists as a better place to send Syrian refugees is deportation-nation Saudi Arabia! 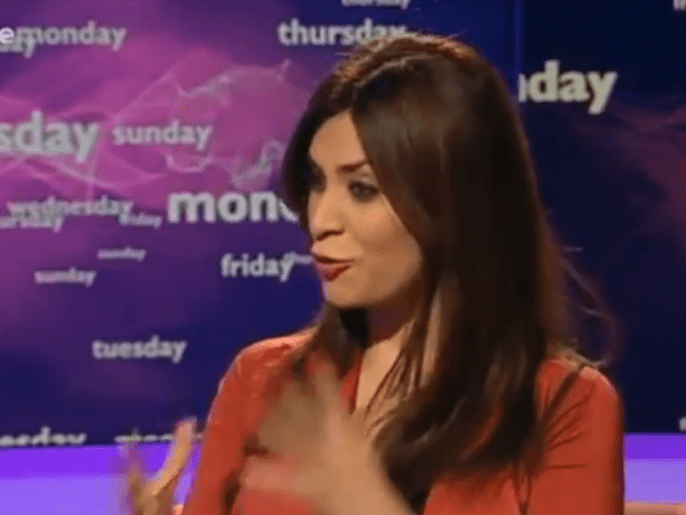 A British-Syrian TV pundit is threatening to sue social media users who slander her or threaten her life after her recent controversial views regarding not allowing Syrian refugees to come to Britain were aired on a BBC program. Halla Diyab, a writer and producer based in London, told BBC One’s This Week news program that Syrian refugees would be better off seeking asylum in neighboring Arab countries such as Saudi Arabia, Lebanon, Jordan and Egypt – rather than coming to England where they will face a cultural barrier such as not being able to speak English. Syrian refugees shouldn’t be “picky and choosey,” she told the BBC’s Andrew Neil. She also voiced concerns over how much allowing Syrian refugees into the country would cost British taxpayers. Many people publicly condemned Diyab’s views referring to her as “Syria’s Sarah Palin”;’ however, the British-Syrian pundit is now concerned the criticism has went too far with some angry viewers saying she is an Assad-loyalist and others making comments about her morality. There is much wailing and moaning from the ‘humanitarian’ crowd who call her insensitive. You can read all of that yourself. I guess she, or they, don’t know that some of their ‘humanitarian’ brethren would agree with Diyab (here). Then she asked who will pay for all of this? And, if peace comes, will they go home or will taxpayers continue to support them? Yikes! The ultimate sin to ask those questions! During one part of Diyab’s BBC appearance, now available online, Diyab takes a sip of coffee, and asks: “If Syria returns to peace, will the British government force them to go back to Syria or will they stay here forever? “It would be much better for them to stay in neighboring countries that are close to Syria culturally and demographically, like the United Arab Emirates, Jordan, Egypt, Saudi Arabia and Lebanon,” she added. And, the you-know-what hit the fan on social media. Hang in there Halla! The answer is yes, of course, these refugee resettlements are always permanent, even when the word ‘temporary’ is bandied about. Regarding our photo caption. Consider for a moment what would happen to the immigration issue if a large majority of immigrants arriving in America, or the West generally, said they would vote for conservatives. In a heartbeat, the political Left would be demanding we halt all immigration! Heck, they might be at the border with guns! Some people might call her “Sarah Palin”, but Halla Diyab is considered “too liberal” by Middle Eastern conservatives! Halla grew up in the Middle East and knows and understands the culture of Syria, Lebanon, and Palestine thoroughly – so do the Saudis, the Emiratis, the Egyptians, and others who do not want to see many Syrians settling in their lands. Do they know something that we are clueless about? LOL! You mean another thing that we are clueless about!